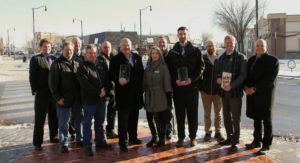 The Lacombe Main Street Program in Lacombe, Alberta, Canada has received the Envision® Silver Award for sustainable infrastructure, designated by the Washington, DC-based Institute for Sustainable Infrastructure (ISI). To reach Silver status, a project must demonstrate that it delivers a range of environmental, social, and economic benefits to the local community. The Lacombe Main Street Program is the first project in the Province of Alberta to earn an Envision Award. 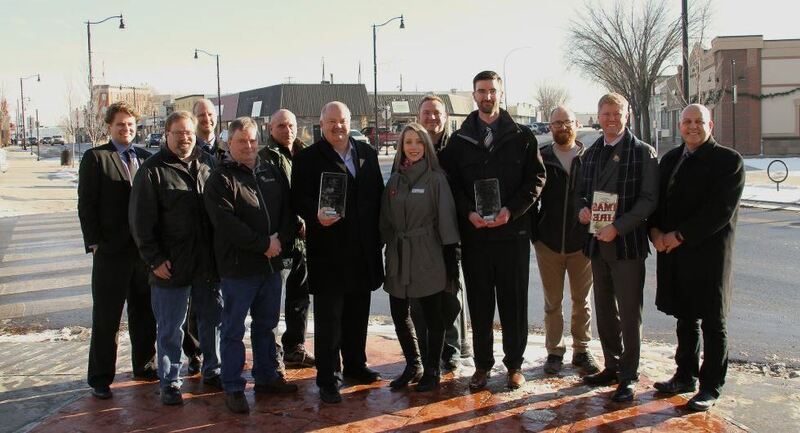 The City of Lacombe worked in close collaboration with Stantec and Pidherney’s Inc. to deliver this award-winning sustainable infrastructure project which has also recently been recognized with the American Public Works Association (APWA) Alberta Chapter Project of the Year Award. Mayor Creasey (center) celebrates Silver Envision Award with Council members, city staff, Stantec staff and downtown business leaders. Photo courtesy of City of Lacombe. In 2015, the City of Lacombe discovered that the sanitary sewer along 50 Avenue was in urgent need of repair. 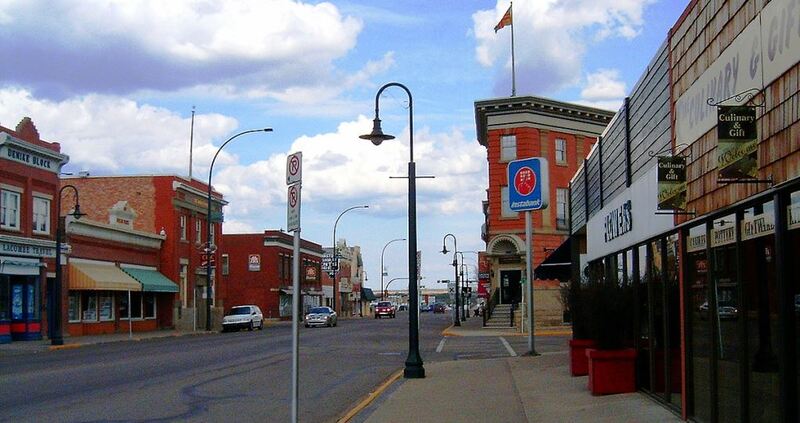 Less invasive repair alternatives were not available due to the condition of the sewer system, therefore, Main Street through Lacombe’s Historic Downtown would need to be closed during construction to complete an open cut sewer main replacement. To limit future disruption to this critical downtown business area, the City took a proactive approach by having the project team review future infrastructure needs for a growing population and business sector. In addition to the sanitary sewer improvements, a wide variety of community assets were improved or rehabilitated as part of the Main Street Program. The City of Lacombe has focused on delivering infrastructure projects based on the fundamentals of sustainability, asset management, and resiliency. Envision is a groundbreaking resource for professionals involved in planning, designing, building, and maintaining civil infrastructure. Key factors contributing to the Main Street Program earning Envision Silver include improved community quality of life; improved site accessibility, safety, and wayfinding; improved infrastructure integration, enhancing public space; and providing for stakeholder involvement. What makes the Lacombe Main Street Program unique is not just the emphasis placed on meaningful stakeholder engagement or building relationships within the community, but the focus on collaboration at every level, process, and stage of the project. The Collaborative Design Process developed by the Main Street Program’s project team far exceeded the requirements outlined under this Envision credit. For those reasons the project was recognized with the Innovation credit in this category. “Pidherney’s early involvement in the project design phases allowed our team to help identify risks and opportunities and gain a more detailed understanding of how we can schedule and coordinate with the downtown community,” said Dan Willis, Civil Projects Manager at Pidherney’s. “We were able to participate in presentations and stakeholder engagements that provided the most detailed and accurate information possible on schedules and methodology well in advance of construction. In turn, the downtown community brought forth specific concerns and comments that allowed the project to reach a new level of service during completion,” he continued. Infrastructure projects that apply the Envision® Sustainable Infrastructure Framework may be submitted for review by an independent third-party to confirm a level of achievement. The framework examines the impact of sustainable infrastructure projects as a whole, through five distinct categories: Quality of Life, Leadership, Resource Allocation, Natural World, and Climate and Resilience. Projects can be awarded a Bronze, Silver, Gold or Platinum award based on meeting minimum scoring thresholds, which are judged based on project documentation and achievement.